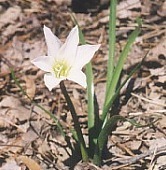 This early bloomer is also called an Easter Lily and is usually in bloom at easter in the piedmont and coastal plain of North Carolina. The smooth flower stalk and flat leaves grow from an underground bulb, which is poisonous, as arer other members of the Amaryllis Family. The Greek name Zephyranthes refers to Zephyrus, the west wind who is husband of Chloris the goddess of flowers.